“For the students who do take full advantage of these new partnerships, the sky’s the limit on where they can go in their careers,” says Abol Jalilvand, PhD, professor of finance. 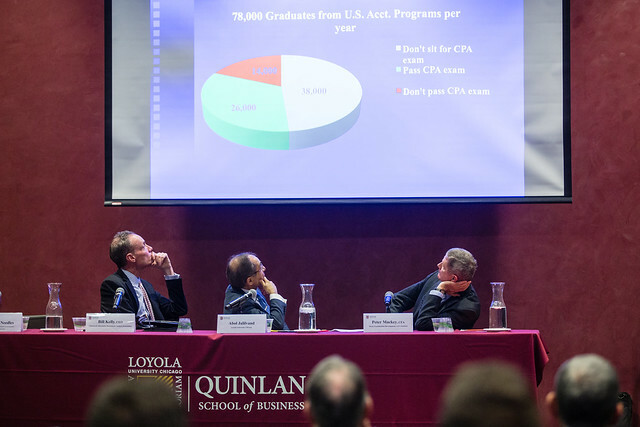 On March 28, 2017, the Quinlan School of Business held a signing ceremony to commemorate new partnerships with the CFA and CAIA—two leading professional organizations in the finance and investment industry. As part of these new partnerships, the CFA and CAIA vetted the curricula of Quinlan’s undergraduate and graduate finance programs to ensure that it adequately prepares students to take their challenging external certification exams. “It’s our responsibility as a leading business school to make sure that our students are not only trained conceptually, but are also trained professionally for the practice of business and finance,” says Abol Jalilvand, PhD, professor of finance and Ralph Marotta Chair of Free Enterprise at the Quinlan School of Business. “These partnerships will help us bridge the theory-practice gap and prepare the next generation of women and men equipped with the highest ethical responsibility and financial acumen,” Jalilvand says. According to Jalilvand, in the past, companies would hire students with limited practical knowledge, and invest time and resources to help and train them on professional standards required to work in business. However, companies have generally stopped providing such training in recent years primarily due to cost consideration. Graduates are now turning to respected external certification exams, like those offered by CFA and CAIA, to increase their practical knowledge and differentiate themselves. Students applying to take the CFA or CAIA external certifications exams will receive mentoring and additional support from Quinlan faculty. And those who earn these external certifications can expect increased employability, and a better understanding of business standards in the investment and finance industry. “For the students who do take full advantage of these new partnerships, the sky’s the limit on where they can go in their careers,” Jalilvand says. Both Kelly and Mackey look forward to the partnership and working with Professor Jalilvand and Quinlan’s finance department for years to come.